One of the problems with a low carb/low sugar Paleo type diet is breakfast. Besides bacon and eggs, salmon and avocados, and the occasional almond/coconut flower pancake it is really difficult to figure out what to eat, especially a quick meal in the morning. I ended up eating lots of veggie crackers with coconut or almond butter but finally got tired of that as well. After I got a Nutribullet mixer early this year I started experimenting with new breakfast smoothies and let my inner alchemist go crazy. So here is a smoothie recipe, specifically suitable for folks with Lyme and Candida , that I have been playing with and refining over time. The result tastes like eggnog or vanilla pudding, its really good actually and quite easy to make. 2 TBSP of hydrolyzed collagen from grassfed cows - helps rebuild collagen damage caused by borrelia; I like the brand from Dave Asprey, Upgraded Self. Alternatively one can use gelatin from grassfed cows, although it may not mix as well as collagen. Sometimes I also add cold processed whey from grassfed cows such as this brand. I would not recommend any soy protein powder. A handful of soaked sunflower seeds - I soak them over night and rinse them out to get rid of phytic acid, which may not be ideal for the intestines; if I am in a hurry then I just soak them briefly in the morning with hot water. The lecithin in the seeds should help with nerve repair, specifically the myelin sheaths covering the nerves. 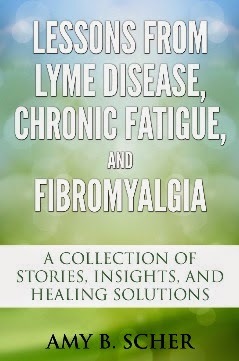 Over time this may help with little Lyme muscle tremors, that are caused by nerve damage. Alternatively one can use lecithin powder. Often I add other soaked nuts, like almonds or cashew, to the mix to get some variety. Brazil nuts have a high nutritional content and should be ideal for this. Just make absolutely sure the nuts don't have any mold on them. I have also tried canned coconuts, makes the mix very smooth and works well. 1 TBSP of Chia seeds - contain a a high concentration of essential fats including Omega-3 fatty acid. Lots of minerals as well. I typically grind them at time of use (I just throw them in the mixer first). If you grind them and store them in a jar, the oils may start oxidizing over time. I keep changing back and forth between chia seeds and flax seeds to get some variety. 2 -6 TBSP of Coconut Oil or MCT Oil - This is for immediate brain energy, especially MCT processed from coconut oil . It works amazingly well! Alternatively one can use butter (a good size chunk) or a combination of coconut oil and butter. If you are scared of butter and cholesterol see David Asprey's whole philosophy on butter. Its a real eye opener. 1/2 - 1 carrot (raw or cooked) - I do add some GAPS diet friendly carbohydrates to the mix to get a bit more energy and just a little bit of sugar on top of all the fats and proteins. Alternatively you can use a couple pieces of pumpkin, summer or winter squash. Since I am only using Stevia as a sweetener having a little bit of carbohydrates may help with weird blood sugar issues caused by Stevia. See the blog entry from Lauren over on Empowered Sustenance for more info on that. 1 egg - Optional to add some good fats and protein. I use pastured eggs and rinse them in acidic water to kill any salmonella that may be on the shell. Empowered Sustenance has a good summary on raw egg safety and what type of eggs to use. Sweetener: Stevia, honey or dates - If you are able to eat sugar (I am not) then use honey as your first choice. I end up using Stevia. As mentioned, there are issues with it, but that's really my only option at this point. 1-2 cups Almond milk, Cashew milk, coconut or any other nut milk - this is for mixing all this stuff together. Just make sure your nut milk does not contain any carrageenan, it may end up hurting your intestines. Make it as thick or fluid as you like. Since the mix is already very rich plain water is also sufficient. What also works is water with some coconut milk powder. Last but not least, the flavor- Organic vanilla powder is my first choice, about 1 TSP. Vanilla is also a good antiinflamatory. Alternatively you could use organic, raw cocoa powder or a combination of cinnamon, cardamon and anise (chai taste). If you are ok with sugar then any berries will work well, blackberries, blueberries, etc. I also use juice powder from black currents, which don't contain a lot of sugar and in moderation are ok for candida sufferers. I keep changing between the different flavor combinations but I always try to use cocoa powder sparingly as I notice that it effects the liver when used too often. Cordyceps mushroom powder - contains beta glucan and helps immunity. May make the whole thing taste a bit weird though. Ginger or Tumeric Powder - strong antiinflammatory. I have not tried that yet, it may end up tasting a bit weird. I think it may work well with ginger, cinnamon and anise. I do feel a difference in energy with this breakfast. It keeps me going for a long time, I am not even hungry until early afternoon. One more thing. I start my day with a green's mix to alkalize my body first thing in the morning and get pure green food and their nutrients in first. The smoothie is my second meal, taken about 1/2 hour later to give the greens a chance to get into my body and do their job. I also found a cool ketogenic smoothie recipe from Ben Greenfield, he uses avocados, kale, coconut milk and chocolate. Among all recipe for breakfast I like the Cordyceps mushroom powder due to its medicinal good side and its taste. chao môn tây ninhHiện nay trên thị trường cũng có rất nhiều địa chỉ bán chao môn tây ninh. Bạn không biết nên mua ở địa chỉ nào mới đảm bảo chất lượng. khi yêu con trai thích con gái để tóc gì? bà bầu ăn ổi nhiều có sao không? bà bầu ăn trứng vịt lộn nhiều có sao không?